Cristiana is originally from Portugal but came to study in London when she was 18. She began her directing career at the age of 22 with a short film about Burlesque stripper Dita Von Teese. Aired on the Discovery Channel to wide acclaim it was subsequently featured on the famed UK Friday Night Show with Jonathan Ross. She got signed as a director to Knucklehead and her initial success quickly led to a second documentary for the Discovery Channel about the famous German neo-expressionist painter Rainer Fetting and eight films for Landrover shot in locations as diverse as the Mojave Desert, Hollywood, Slovenia and the wilds of Warwickshire. In 2008 Cristiana started a series of advertising projects for Johnnie Walker’s anti drink & drive campaign with Lewis Hamilton and Mika Hakkinen which were premiered at the Singapore Grand Prix. She continued to work with Lewis, Mika and Jenson Button on a regular basis filming for Johnnie Walker across the globe.This led to a long term project called ‘Step Inside’ where she documented the two world champion Formula One drivers. These short documentaries have been aired worldwide. Her early success got the attention of Shots Magazine where she got featured on Issue 49. 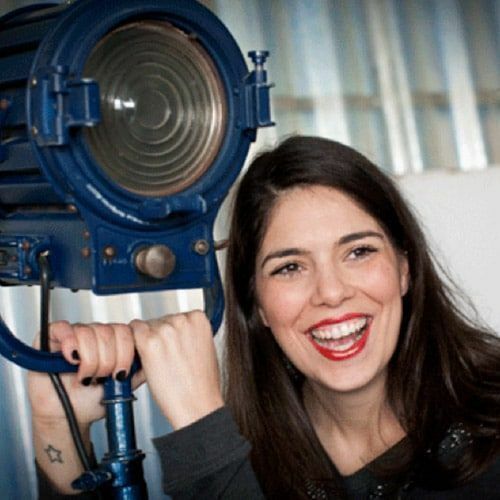 Cristiana has directed major national campaigns in Portugal including Oliveira da Serra ‘Rain of Olives’ which was voted Portuguese Ad of the year in 2011 and a series of spots for national phone brand TMN. Her local success has led to articles in Vogue and Maxima as well as an invitation to feature in a national poster campaign for TMN. She also got a lot of attention from local and international press when she shot the beautiful music video for Dido “The Day Before the Day”. Filmed in the town of Nazare in the North of Portugal as part of a series of shorts / music videos that Dido commissioned to various directors around the world. Cristiana’s piece was voted as the favourite on the project’s website . She won another award in 2013 with a spot for Portuguese bank CGD. In the same year she set up her own production company in Lisbon called PLAYGROUND. In early 2011 Cristiana joined PASSION RAW, the live action arm of the multi-award winning Passion Pictures, for which she shot back to back jobs including the Adidas F50 spot for Sid Lee with football star Lionel Messi. It was released on TV across Europe and the US. In 2012 Cristiana’s project for Citroen featuring the Arsenal Football team and the English National Ballet has received over a million hits on YouTube. She also directed a film for Burberry as part of a huge 360 event to launch their flagship store in Taipei. Cristiana has also been busy filming for high end beauty range SK- ll. She shot on a couple of occasions with Chinese actress Tang Wei in Hong Kong and Shanghai, then Koyuki – star of ‘The Last Samurai’ and Momoi in Tokyo, Kim Hee Ae in Seoul and Jeab and Susan Bachtiar in Bangkok. In 2014 her highlights were the stunning L’Oreal 60’sec TVC for Elnett with Cheryl Cole, the Credit Suisse job she did with Roger Federer and the Swiss National Football Team and the five TVC’s she did for Jockey. She´s also continued her work with L’Oreal Portugal and she ended the year shooting a 1.30m film for SAMSUNG for the global launch of their new product the ‘Gear Circle’. In 2015 she joined Black Label for UK representation.